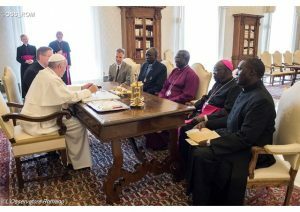 23 February 2017 – Church leaders of the Catholic Church in South Sudan, gathered in Juba from 21-23 February 2017, issue a pastoral message to the faithful and people of South Sudan. We believe that “technical” programmes are not enough. Hence we have instructed our Pastoral Commission to mobilise a national spiritual approach, as we did for the Referendum. Gaudium et spes, Second Vatican Council.